The new Swarm 5 FX from CHAUVET DJ marries LED and laser technology; and it’s a “marriage made in heaven” for mobile entertainers looking to get the most out of their lighting investment. An incredibly versatile fixture that excels at just about any role it’s asked to fill, the Swarm 5 FX is really three products in one: an intense RGBAW rotating derby, a red and green laser, and a white strobe. 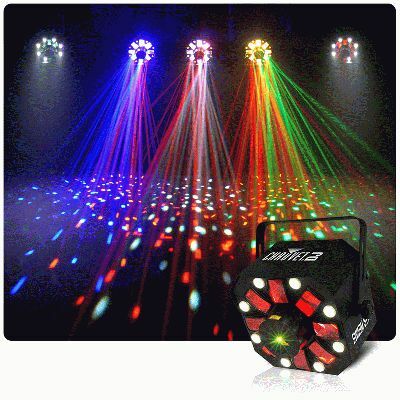 The DMX-controllable fixture can work as any of these three “products” exclusively, or it can operate in two or three modes simultaneously to create a thrilling multi-dimensional lightshow that combines the eye-popping brilliance of a color effect, laser and strobe. Compact and easy to transport, the Swarm 5 FX is ideal for DJs who want to add extra versatility to their show without adding a lot of extra weight to their rig. The Swarm 5 FX isn’t just “good” at doing a lot of different things, it excels at them, says Reiss. As a rotating derby, it features red, green, blue, amber and white LEDs, so it’s got impressive color capabilities. As a laser, it projects thousands of red and green laser beams to create excellent spinning wheels and star effects; and as a strobe, it features eight 1-watt white 300 mA LEDS with a 0 to 20 Hz strobe rate and a 35° beam angle. The versatile Swarm 5 FX can be controlled via DMX or through automated and sound-activated programs, as well as Master/Slave mode. There are nine DMX channels and 3-pin XLR DMX connectors. Mounting hardware included with the fixtures makes it easy to attach to standard lighting tripods or truss.